The group of stars in the heavens known as the Summer Triangle is visible all winter long, as well as high in the sky throughout the summer. Go out just after sunset, face southwest, and look straight up into the indigo sky. You will see three bright stars forming an isosceles triangle. This triangle consists of the constellations Lyra, the Harp, with Vega as its most prominent star; Aquila, the Eagle, Altair being its first magnitude star, and Cygnus, the Swan, Deneb its brightest star. Altair is the apex of this isosceles triangle, with Deneb and Vega forming the base. Aquila represents an eagle, the thunderbird of the Greeks. In Greek and Roman mythology the eagle was the bird of Zeus, carrying and returning thunderbolts the wrathful god hurled at his enemies. Yet the eagle was involved in love as well as war. The constellations of the Eagle and the Swan are linked in an account from Hyginus. Zeus fell in love with the goddess Nemesis but when she resisted his advances, he turned himself into a swan and had Aphrodite pretend to pursue him in the form of an eagle. Nemesis gave refuge to the escaping swan, only to find herself in the embrace of Zeus. To commemorate this successful trick, Zeus placed the images of swan and eagle in the sky. Originally called in Latin Vultur Volans the Flying Vulture, or in England the Flying Grype, Aquila represents the eagle, thought to be Jupiter himself. 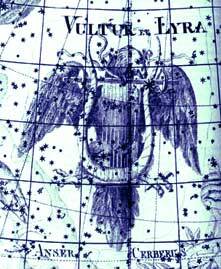 The constellation's brightest star Altair itself derives from Al Nasr al Tair, translating to the Flying Eagle. According to one story, Aquila is the eagle that snatched up the beautiful Trojan boy Ganymede, son of King Tros, to become the cup bearer of the gods. Ovid says Zeus turned himself into an eagle, guarding the arrow of Eros that made Zeus love-struck. 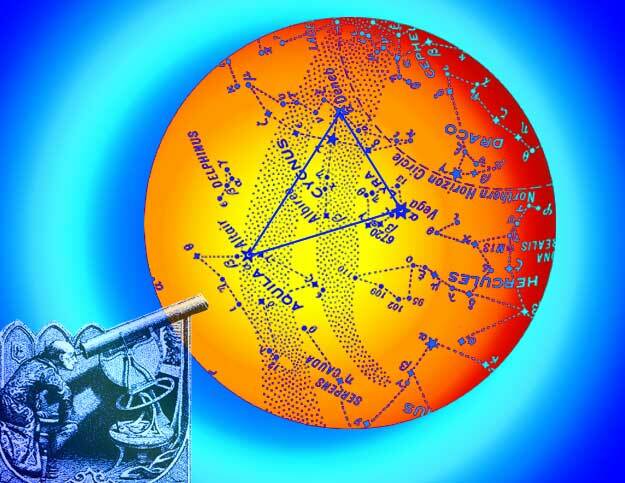 For the Hindus, with Aquilas beta (Alshain) and gamma (Tarazed) stars, and its brightest Altair, this constellation constituted the twenty-first Hindu nakshatra Sravana, the Ear, and probably was at first so drawn Although also known as Crona, which means Lame, or as Acvattha, the Sacred Fig Tree~ as Vishnu was regent of the asterism, these stars represent the Three Footsteps with which that god strode through the heavens. In astrology Altair was a mischief-maker and portended danger from reptiles. And according to Ptolemy, Aquilas influence is similar to that of Mars and Jupiter ~ it is said to indicate great imagination, strong passions, indomitable will, a dominating character, influence over others, clairvoyance, a keen penetrating mind and ability for chemical research. The other constellation is Cygnus, symbol of Soul. The aspirant looks to the left and to the right: to the right seeing Aquila and says to themself, "I am spirit flying straight for my home." And looking to the other side, seeing Cygnus, the Swan, with its four stars in the form of a cross, the disciple says, "I am the soul crucified in matter from which I shall release myself." A popular name for Cygnus is the Northern Cross, and indeed its shape is far larger and more distinctive than the famous Southern Cross. In its cruciform shape the Greeks visualized the long neck, outstretched wings and stubby tail of a swan flying along the Milky Way, in which it is embedded. Mythographers tell us that the swan is Zeus in disguise, on his way to one of his innumerable love affairs, but his exact target is a subject of some disagreement. The version of the tale that goes back to Eratosthenes says that Zeus one day took a fancy to the nymph Nemesis, who lived at Rhammus, some way northeast of Athens. To escape his unwelcome advances she assumed the form of various animals, first jumping into a river, then fleeing across land and finally taking flight as a goose. Not to be outdone, Zeus pursued her through all these transformations, at each step turning himself into a larger and swifter animal until he finally became a swan in which form he caught and raped her. Hyginus tells a similar story, but does not mention the metamorphoses of Nemesis. Rather, he says that Zeus pretended to be a swan escaping from an eagle and that Nemesis gave the swan sanctuary. Only after she had gone to sleep with the swan in her lap did she discover her mistake. In both versions the outcome was that Nemesis produced an egg which was then given to Queen Leda of Sparta, some say by Hermes and others say by a passing shepherd who found the egg in a wood. Out of the egg hatched the beautiful Helen, later to become famous as Helen of Troy. A simpler version says that Zeus, in the form of a swan, seduced Leda by the banks of the river Eurotas; with this story in mind, Germanicus Caesar refers to the swan as the winged adulterer. Leda was the wife of King Tyndareus of Sparta, which considerably complicated the outcome because she also slept with her husband later that same night. According to one interpretation, she gave birth to a single egg from which hatched the twins Castor and Polydeuces as well as Helen. The shell of this egg was said to have been put on display at a temple in Sparta, hanging by ribbons from the roof. A rival account says that Leda produced two eggs, from one of which emerged Castor and Polydeuces while from the other came Helen and her sister Clytemnestra. To add to the confusion, Polydeuces and Helen were reputedly the children of Zeus, while Castor and Clytemnestra were fathered by Tyndareus. Castor and Polydeuces are commemorated by the constellation Gemini, where Polydeuces is better known to astronomers by his Latin name, Polloux. Cygnus's brightest star, Deneb, marks the tail of the swan; its name comes from dhanab, Arabic for tail. The Greeks had no name for this prominent star. Deneb is a highly luminous supergiant star, nearly 2000 light years away, the most distant of all first magnitude stars. The beak of the swan is marked by a star named Albireo, revealed by small telescopes to be a beautiful coloured doubled star of green and amber. Cygnus lies in the Milky Way and hence contains many attractive star fields for sweeping with binoculars. Its most celebrated object, a black hole called Cygnus X-1, cannot be seen by optical means at all because it is a strong source of X-rays, and lies near the middle of the swan's neck. Vega or Wega, the brightest of the three stars forming the large Summer Triangle, is the fifth brightest star in the sky, and is in the constellation Lyra. It is approximately 27 light years distant and has a luminosity 58 times that of our sun. Its surface temperature is about 9200 degrees Kelvin (3), nearly twice as hot as our sun. Vega's diameter is estimated to be a little more than 2.7 million miles, approximately three times larger than our sun. Due to the precession of the equinoxes, the slowly changing orientation of the Earth's axis in space, Vega was the Pole Star 12,000 years ago and will occupy that position again in 14,000 A.D. It is toward a spot in the general direction of Vega that our sun and the entire solar system move, at a velocity of 12 miles per second. This position is known as the "Apex of the Sun's Way." Some idea of the vastness of space may be gained from realizing that at this speed it would take our sun over 450,000 years to reach Vega. Vega's name is derived from the Arabic Al Nasr al Waki, the Swooping Eagle, because it is depicted as an eagle, vulture, or falcon bearing a harp or lyre in its talons. In Babylonia it was Dilgan, the Messenger of Light. Pliny called it the Harp Star, in reference to the seven-stringed lyre of Hermes and later Orpheus. Vega is also associated with Apollo, Mercury, King Arthur, and the Biblical Kiing David. Early Greek coins from 400 B.C. show the lyre and the head of Apollo, god of music, poetry, and the arts. Vega was also called the Little Tortoise from the legend that Hermes created the first harp from the empty shell of a tortoise that he found outside his cave on Mt. Cyllene in Arcadia. He cleaned out the shell, pierced its rim and tied across it seven strings of cow gut, the same as the number of the Pleiades. The lyre got Hermes out of trouble after a youthful exploit in which he stole some of Apollos cattle. Apollo angrily came to demand their return, but when he heard the beautiful music of the lyre he let Hermes keep the cattle and took the lyre in exchange. Apollo later gave the lyre to Orpheus to accompany his songs. Orpheus, said to be Cygnus the Swan, was the greatest musician of his time, able to charm rocks and streams with the magic of his songs. He was even said to have attracted rows of oak trees down to the coast of Thrace with the music of his lyre, Lyra. He joined the expedition of Jason and the Argonauts in search of the Golden Fleece. When the Argonauts heard the tempting song of the Sirens, sea nymphs who had lured generations of sailors to destruction, Orpheus sang a counter melody that drowned the Sirens voices. Later, Orpheus married the nymph Eurydice. One day Eurydice was spied by Aristaeus, a son of Apollo, who attacked her in a fit of passion. Fleeing from him, she stepped on a snake and died from its poisonous bite. Orpheus was heartbroken. Unable to live without his young wife, he descended into the underworld to ask for her release. Such a request was unprecedented. The sound of his music charmed even the heart of Hades, god of the underworld, who finally agreed to let Eurydice accompany Orpheus back to the land of the living on one solemn condition: Orpheus must not look behind him until the couple were safely back in daylight. Orpheus readily accepted, and led Eurydice through the dark passage that led to the upper world, strumming his lyre to guide her. It was an unnerving feeling to be followed by a ghost. He could never be quite sure that his beloved was following, but he dared not look back. Eventually, as they approached the surface, his nerve gave out. He turned round to confirm that Eurydice was still there~ and at that moment she slipped back into the depths of the underworld, out of his grasp forever. Orpheus was inconsolable. He wandered the countryside plaintively playing his lyre. Many women offered themselves in marriage to the great musician, but he preferred the company of young boys. There are two accounts of the death of Orpheus. One version, told by Ovid in his Metamorphoses, says that the local women, offended at being rejected by Orpheus, ganged up on him as he sat singing one day and began to throw rocks and spears at him. At first his music charmed the weapons so that they fell harmlessly at his feet. But the women raised such a din that they eventually drowned the magic music, and their missiles found the target. Eratosthenes, on the other hand, says that Orpheus incurred the wrath of the god Dionysus by not making sacrifices to him. Orpheus regarded Apollo, the sun god, as the supreme deity and would often sit on the summit of Mt. Pangaeum waiting for dawn so that he could be the first to salute the sun with his melodies. In retribution for this snub, Dionysus sent his manic followers to tear Orpheus limb from limb. Either way, Orpheus finally joined his beloved Eurydice in the underworld, while the Muses put the lyre among the stars with the approval of Zeus, their father. Vega also plays a prominent part in one of the few star-legends of ancient China. In this story it is the Weaving-Girl and Altair is the Herd-Boy. The two young lovers, lost in amorous dalliance, neglected their duties to heaven and are now eternally separated by the celestial river, the Milky Way. But the gods always show compassion, and on the seventh night of the seventh moon, the lovers are allowed to meet, when a bridge of birds temporarily spans the Celestial River of Stars. The disciple learns to play the harp, and makes music with the life. (2) The Kelvin scale, always used for stellar temperatures, corresponds to Celsius but sets zero degrees at absolute zero, or minus 273 degrees on the Celsius scale.